Remember closing date for pre convention special price is 27th April 2012. 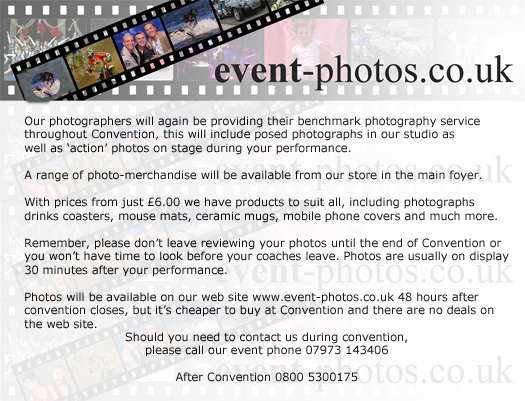 Our photographers will again be providing their benchmark photography service throughout your 2012 Convention. This will include posed photographs in our studio as well as ‘action’ photos on stage during your performance. A range of photo-merchandise will be available from our store in the main foyer. With prices from just £6.00 we have products to suit all, including photographs drinks coasters, mouse mats, ceramic mugs, mobile phone covers and much more. Remember, please don’t leave reviewing your photos until the end of Convention oryou might not have time to look before your coaches leave. Photos are usually on display 30 minutes after your performance. Photos will be available on our web site www.event-photos.co.uk 48 hours after convention closes, but it’s cheaper to buy at Convention and there are no deals on the web site.